John Paul, was given Prophetic Headlines from Newspapers in an open vision, and one of them was called : “The Great divide – The new Normal on the Mississippi River” It was like this was a headline a little while after an earthquake, and they were no longer able to go all the way up the Mississippi from New Orleans, which changes the way business can operate around the Mississippi River. In the Vision an angel brought his sword down on the Statue Of Liberty and split her in two. The vision of the ended with an earthquake as the angel hacked the Statue of Liberty in pieces and she sank into the harbor. Then he started traveling in the air across America. 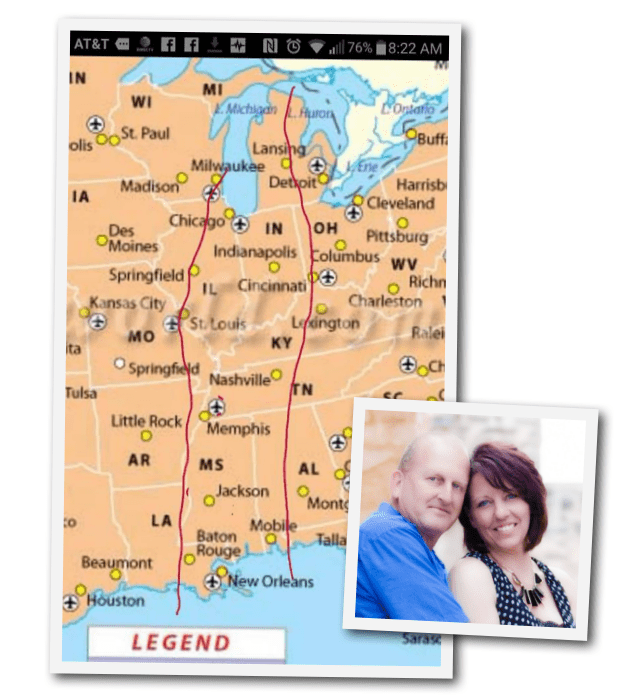 He saw the United States seem to crack in two with a giant earthquake, right down the middle…..
On the way to Sunday service on April 27, 2008 John Killpatrick had a very quick vision where he saw the ground buckling before him. The vision was so real that he moved to the side to avoid what he was seeing. “I knew immediately that it was an earthquake with the potential to do a lot of damage. Almost a month later on May 20 John awoke trembling from a startling dream at 5 AM. 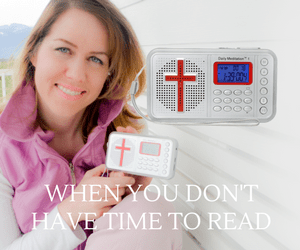 “It was one of the most startling dreams I had ever had during my ministry. I felt it was an addendum to the vision on April 27. I saw the words, ‘wind and water,’ I did not actually see any wind or water damage. I then found myself overlooking a river, which instantly became so wide that I could no longer see either of its banks. The dream then shifted and I was with one of my parishioners running through what appeared to be an old abandoned schoolhouse. This empty building began to shake. The shaking was so violent and severe that it was like the bucking of a wild horse tossing us around. 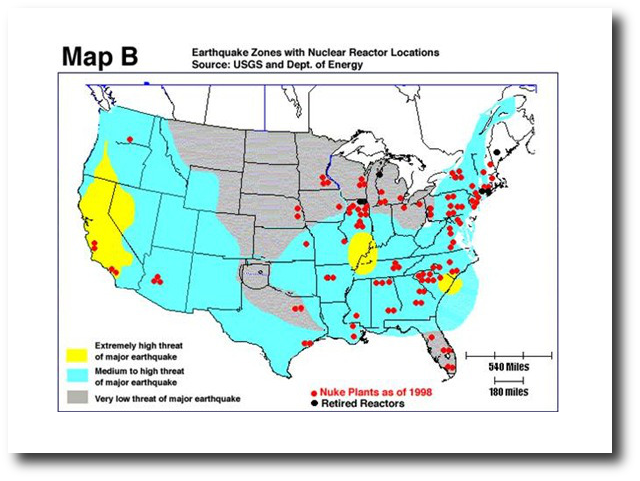 Kim sees the blue transparent shield across the United States and she sees a great earthquake. This earthquake she describes as a split, “from coast to coast, from the Canadian border down to Mexico”. She describes the split as straight in nature. This earthquake is a giant Land divide. Listen to John Kilpatrick’s dream about the New Madrid disaster. He saw in his dream the city of Indianola, Mississippi. 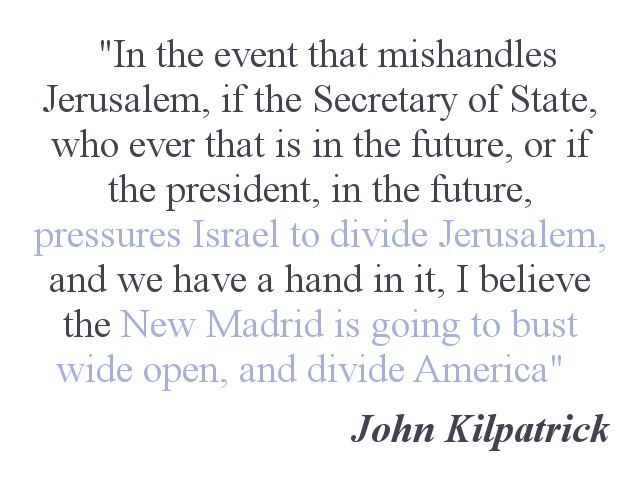 John kilpatrick New Madrid Earthquake Soon!!! 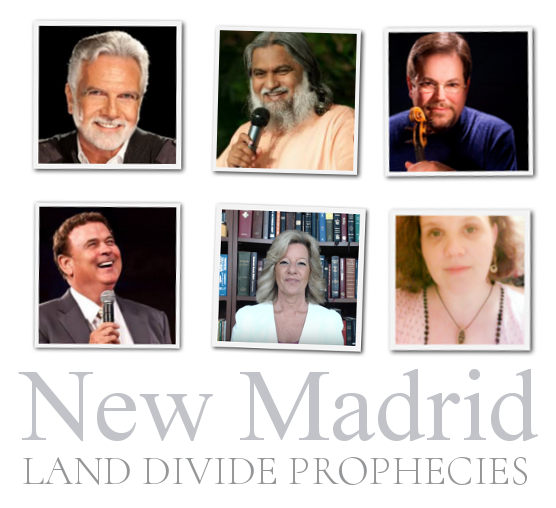 Tracy Pollitt I have dreams about the new Madrid going off. in the dream we are all asleep and awake to being jolted airborne in the middle of living room. And I mean I am flying through the air along with household contents. This is so extremely violent that I’m not sure we live. I wasnt worried about possibly of not living. What concerned me was Nobody was ready. Nobody was prepared. This was more violent in just the first beginning jolt that I cannot express in words how bad. This quake happens in the middle of the night ! 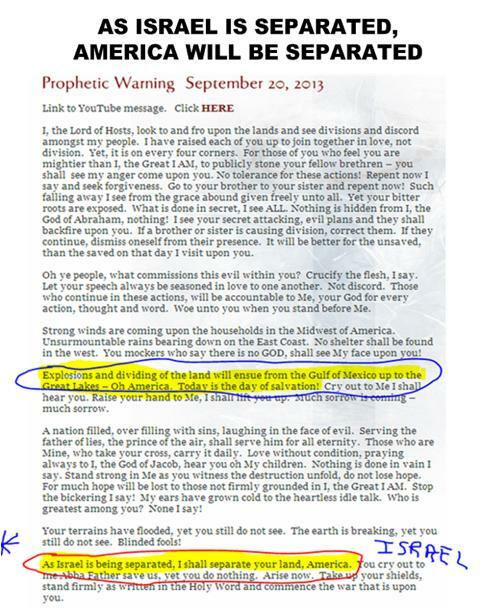 Debra Boettger I Recently Dreamed Of A Line Of Tornados First Coming Across A Body Of Water . ..then turned to left to see them coming across land. Also the night before the bus that recently had a bomb go off on it in Jerusalem….I dreamed of it….I WAS Screaming FOR Everyone To Get Off THE bus. Somehow I knew there was a bomb on it. Prior To Explosion I saw the 2 men. That I sensed had put it on the bus…..their faces I can still remember. Appeared to be middle eastern. If you want to get goose bumps…. 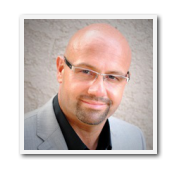 you have to watch this interview with Shane Warren On Sid Roth. Could this be coming in September ? 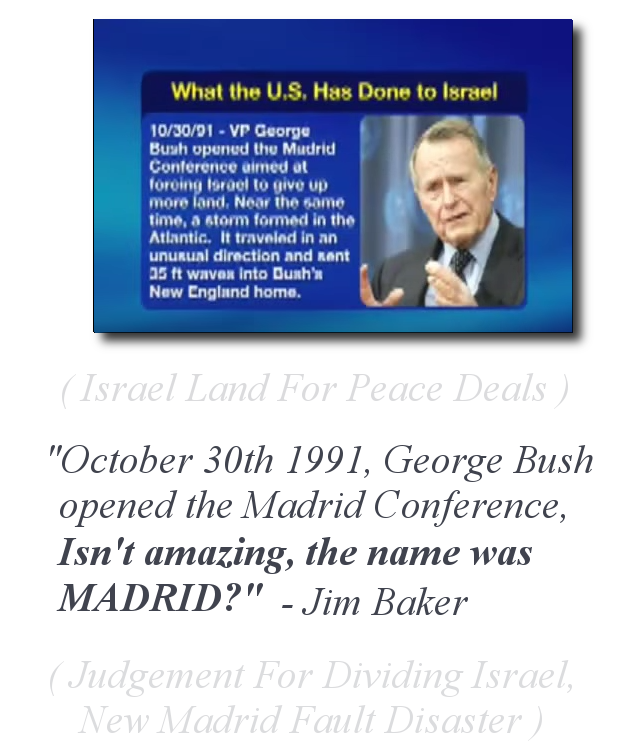 and 3,….. the location,- the Madrid area. 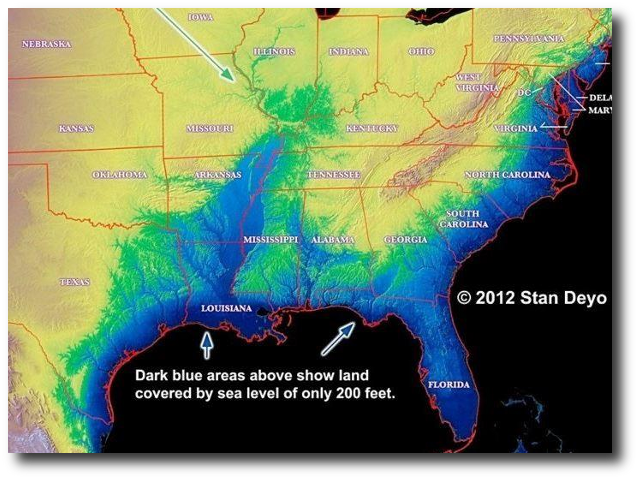 Despite the dangers of the new madrid fault zones, it continues to be fracked, drilled and HAARPed. This region is home to 15 nuclear reactors. 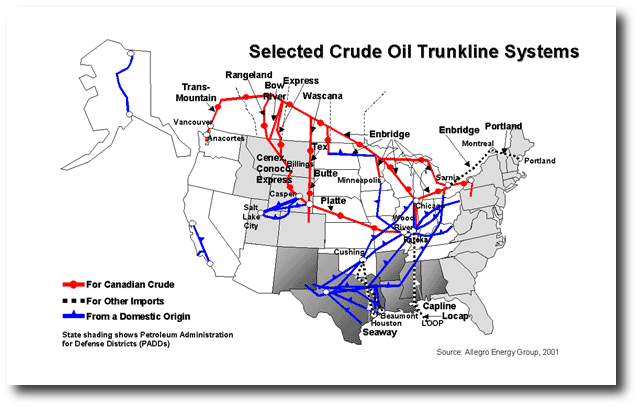 If that is not enough, it also contains the countries major gas and oil pipelines. ProLiance Energy delivers billions of cubic feet of gas per year through 19 major pipelines. 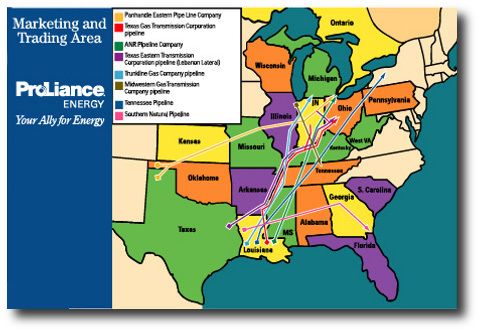 If you notice above, you will see how most of the pipelines cross the New Madrid Seismic Zone. Between 1811 and 1812, 4 catastrophic earthquakes, with magnitude estimates greater than 7.0, occurred during a 3-month period. Hundreds of aftershocks followed over a period of several years. The largest earthquakes since then took place on January 4, 1843 and October 31, 1895 with magnitude estimates of 6.0 and 6.2. 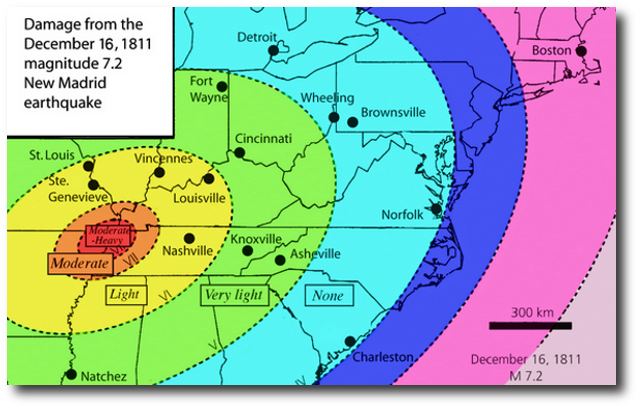 The New Madrid seismic zone is so named because the town of New Madrid, Missouri was the closest settlement to the epicenters of the 1811-1812 quakes. In 1811, the central Mississippi Valley was sparsely populated. Today, the region is home to millions of people, including those in the cities of St. Louis, Missouri, and Memphis, Tennessee. 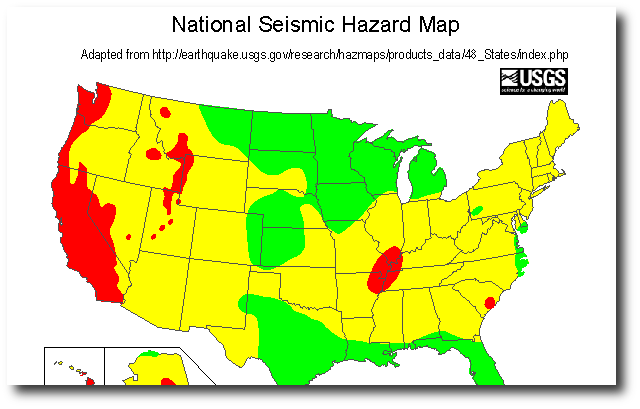 Survivors reported that the earthquakes caused cracks to open in the earth’s surface, the ground to roll in visible waves, and large areas of land to sink or rise. 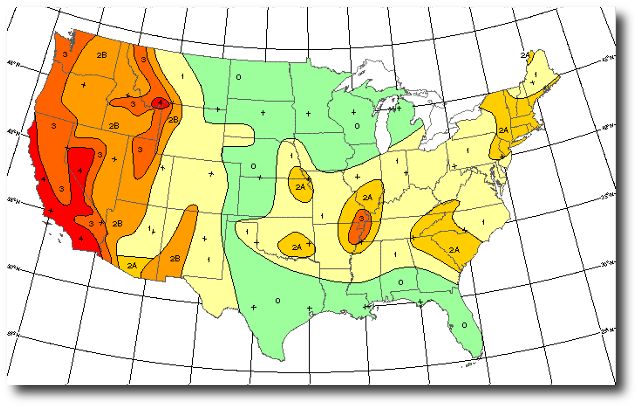 Earthquakes in the central or eastern United States often will be felt longer distances than those on the west coast. West of the Rocky Mountains cause this strong contrast. 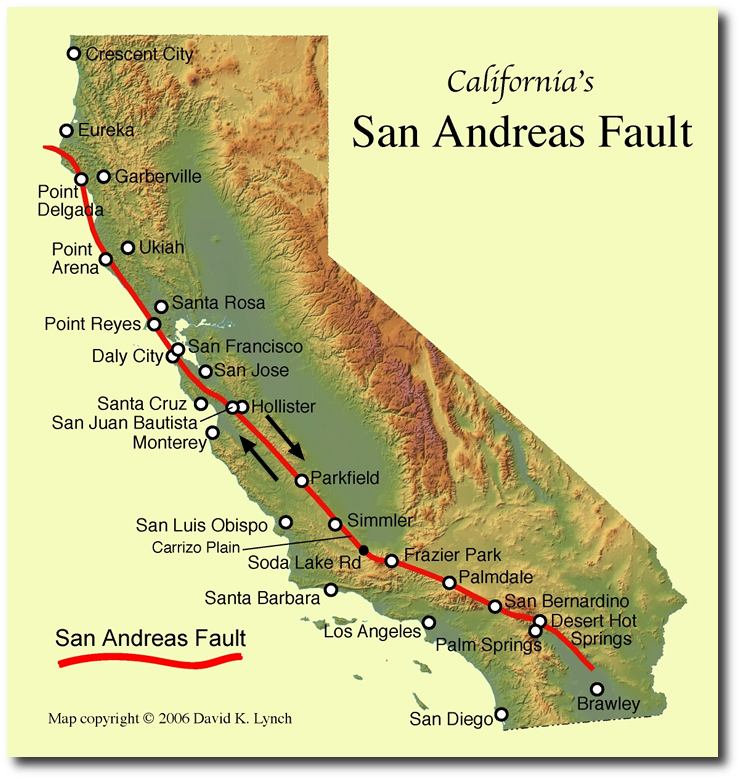 The San Francisco, California, earthquake of 1906 (magnitude 7.8) was felt 350 miles away in the middle of Nevada, whereas the New Madrid earthquake of December 1811 rang church bells in Boston, Massachusetts, 1,000 miles away. Roadways in the Mississippi Valley of Arkansas and Missouri (such as Interstate 55) could become impassable because of bridge failures and fissuring of road surfaces. Venting of large quantities of water, sand, and mud as a result of liquefaction could flood fields and roads and disrupt agriculture for weeks to months. Flooding of farmland, where agricultural chemicals are stored onsite, could contaminate rivers and streams. Failure of levees, especially during high water, would contribute to flooding, and failures of riverbanks could make the Mississippi River and its tributaries difficult to navigate for many weeks. The City of Memphis and the surrounding metropolitan area of more than one million people would be severely impacted. Memphis has an aging infrastructure, and many of its large buildings, including unreinforced schools and fire and police stations, would be particularly vulnerable when subjected to severe ground shaking. Relatively few buildings were built using building codes that have provisions for seismic-resistant design. 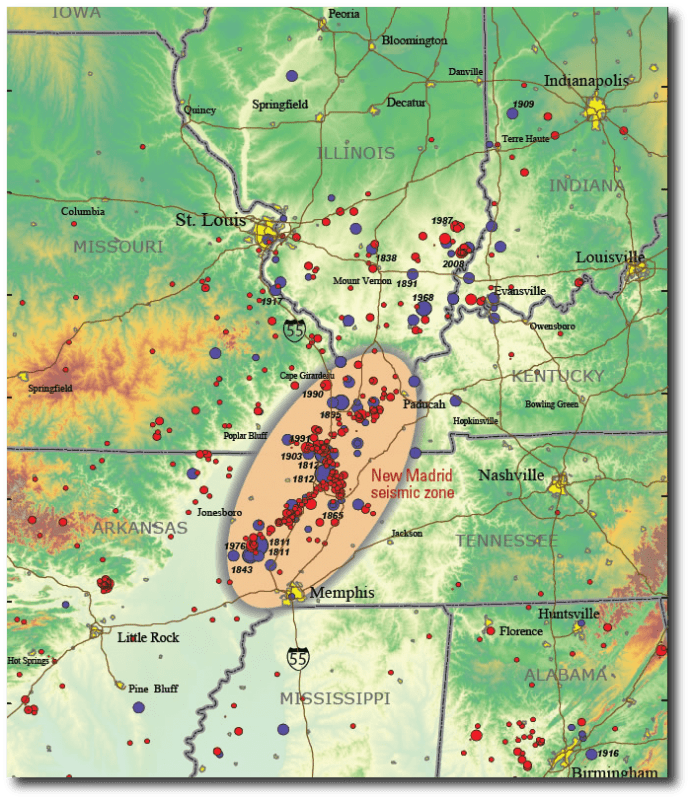 Soil liquefaction and related ground failures are likely to occur in downtown Memphis along the Mississippi River and along the Wolf River that passes through Memphis. 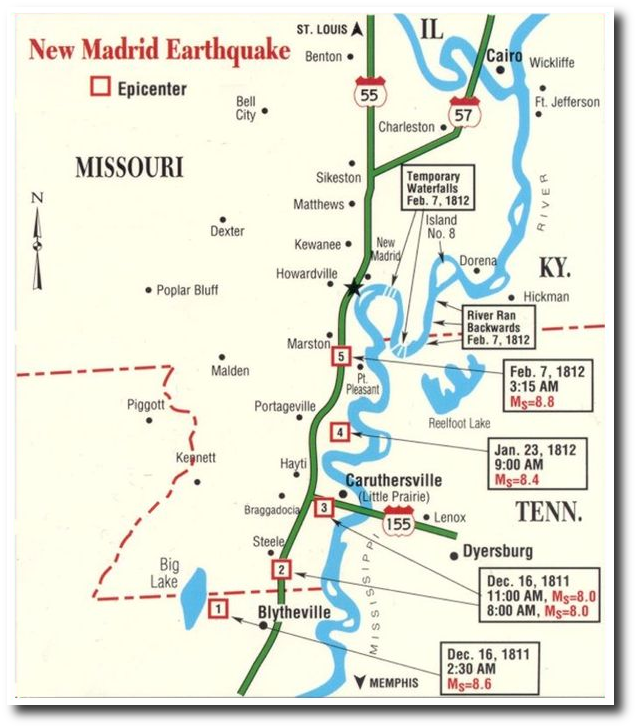 The older highways and railroad bridges that cross the Mississippi River, as well as older overpasses, would likely be damaged or collapse in the event of a major New Madrid earthquake. Some of the bridges and pipelines crossing the Wolf River might be damaged or destroyed. Although Memphis is likely to be the focus of major damage in the region, St. Louis, Mo., Little Rock, Ark., and many small and medium-sized cities would also sustain damage. 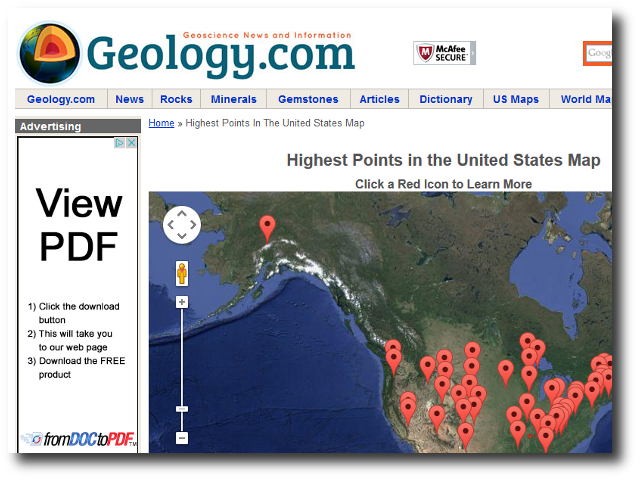 The above map shows the locations of nuclear power plants in the US. Look in the New Madrid area, you can see a concentration of them. 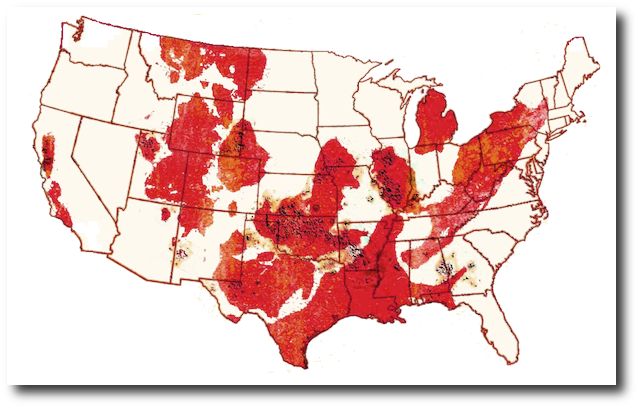 The map above shows where fracking is most concentrated. 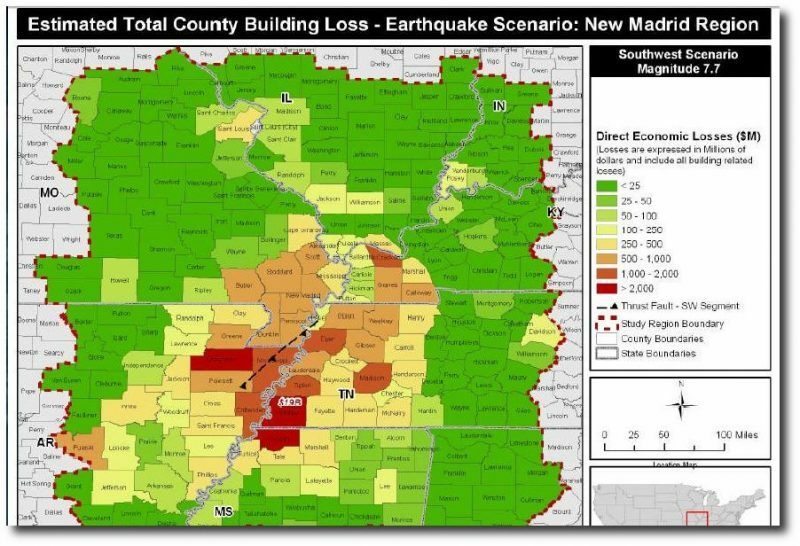 Since September of 2010, over 800 earthquakes rattled Arkansas and the New Madrid Fault Line. 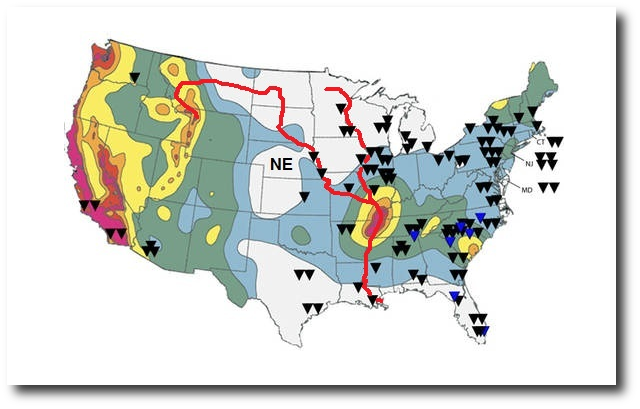 The New Madrid Zone is believed to be a part of a complex of faults that extends down the Mississippi Valley into The Gulf of Mexico. Oil and gas being extracted from beneath this zone at enormous rates, but an extraction process called fracking is further exacerbating seismic activity in the region and might even trigger a mega-quake. 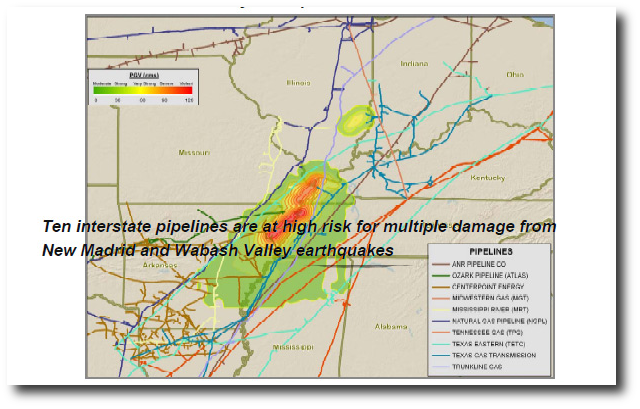 Look at the major gas pipelines that directly cross the New Madrid fault region. It’s said that if this blew it would be visible from the moon. 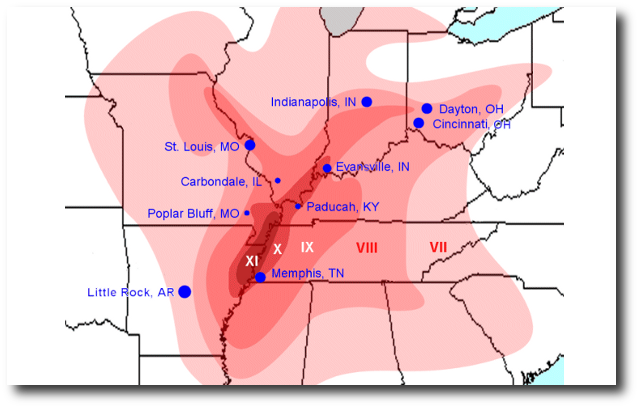 From December 1811 to March 1812, an estimated 3,600 shocks were generated from the New Madrid Fault zone, including three major quakes thought to have been of a magnitude of 8.1 or greater on the Richter scale. The area with most severe damage covered 5.000 square miles. 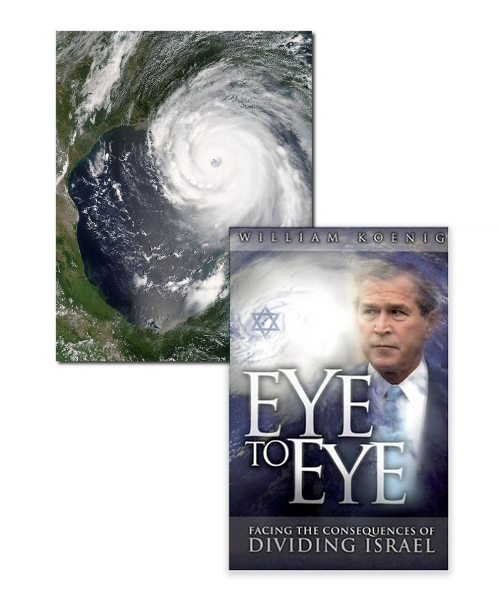 After being married a couple years, I was given a book called Eye to Eye By Bill Koenig, which details out all the disasters and the correlation to dividing of the land in Israel. 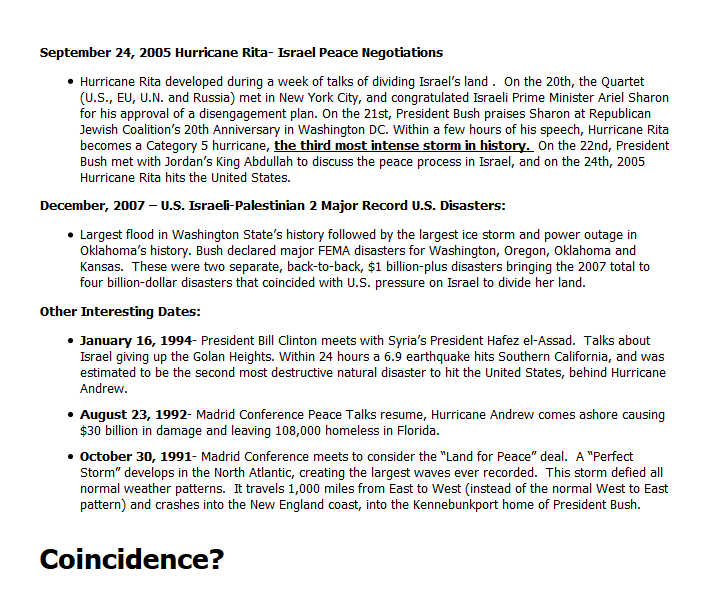 It caught my attention, because on my wedding day, during hurricane Katrina, there was peace talks in Israel. 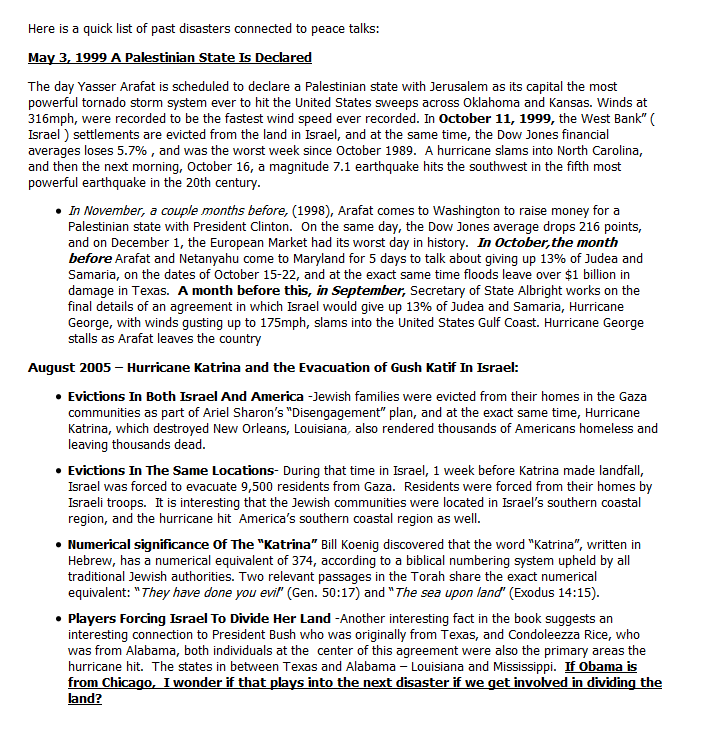 This book listed out the most costly disasters in US history, and they are all related to talks of dividing the land. I was interested in this book, because it listed out startling UNIQUE evidence for God like nothing before I had seen. 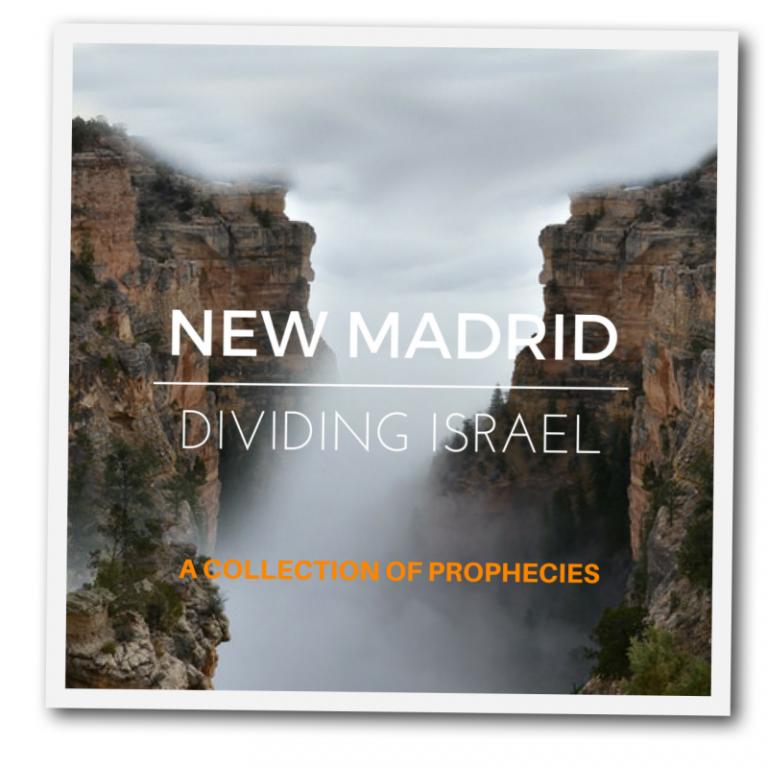 God has promised to bless those that bless Israel, and to curse those that curse Israel. 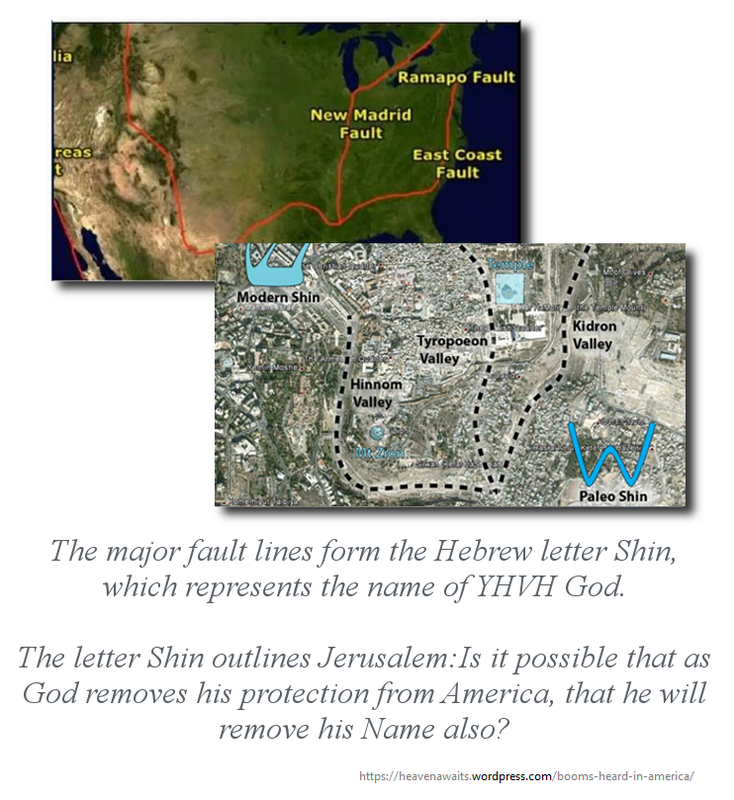 God is active today as He was thousands of years ago, and Israel belongs to HIM, and Him alone. Sadly our nation has cursed Israel by pressuring her to divide her land, and we will face the consequences again if we head down that road.